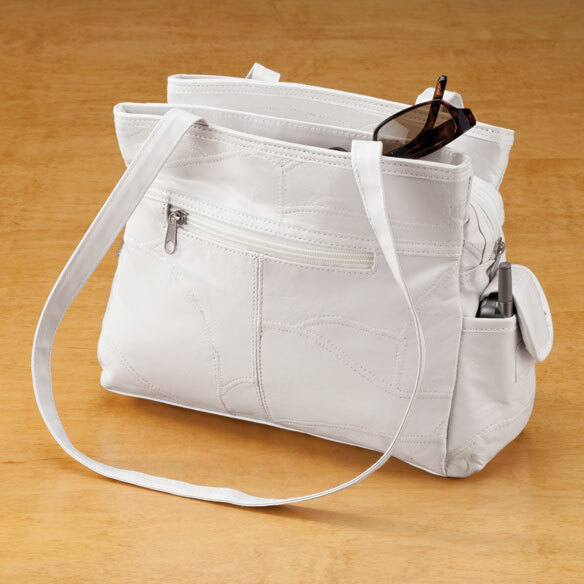 Hard-to-find white patch leather handbag gives organization a new look. Leather handbag features 3 secure interior zip pockets and 4 exterior pockets: 1 zip, 1 open, phone pouch and umbrella pocket. White lining makes it easy to find items. Professional clean. White leather handbag is 8 1/2" L x 11 1/2" H x 3 3/4" W with 14" drop. This is very nice. I should win a prize for choosing this. Made a most appreciated gift. Very happy with the handbag I purchased. First of all, the product looked just like the picture on the website. It is very well made and has multiple pockets for everything without looking too "busy". It is hard to find a true white handbag..
love all the space and compartments it has. just wish the shoulder straps were a little longer. Wish the straps were sturdier because the purse holds alot. Was excited for a nice summer purse and all my items fit well, but the smell of the leather was awful. Not sure if it was from the plastic it was in or the gel packs or what but I'm still trying to get the odor out. It's been sitting outside for 1 week now and I had to change wallets because the smell transferred to the one I had put inside. Very disappointed. I was disappointed, the zipper broke on the first try. the zipper was of poor quality and very stiff. I liked the size and the features it had. My mother has been looking for a white purse to replace hers. This is the closest I can get. Not very fond of the patchwork type material but hope she overlooks it. Finding a white compartmentalised purse was darn near impossible. It was very difficult to find a white purse. Hopefully the quality will be good. Mother needed a new white purse and nowhere locally could one be found. So to the internet I turned, and Easy Comforts was one of the first stores that came up at the google search line. I liked what I saw and went and purchased the purse. Was looking for an affordable white handbag! It's white and not so big. I need a casual white bag to wear with white sandals. The price and style are right. I've been looking for a white genuine leather handbag that costs less than $100. I was willing to even go faux leather but it seems white just may not be "in" at the present time. This purse has all the features I require...and more. Others whom made this purchase said it was very nice, well made. Highly recommended item. Good quality. I wanted a white shoulder bag and it had a lot of compartments. I chose it because I've exhausted all attempts to fund a white bag for church in local area stores. I also like the affordable price. every year i look for a white handbag, and they are always sold out.....glad i found this one! Because, I have been looking for a white leather bag and this one is fine and reasonable. Needed a white purse to finish out the summer. Price was right and I liked the looks of the purse in the photo. have had a hard time finding a white purse with the side pockets - love this style! Is this a crossover handbag? BEST ANSWER: Thank you for your question. Unfortunately no this is not a cross over bag. We hope this information will be of help to you. DO YOU HAVE THIS HANDBAG AT THE STORES?